It is finished!! 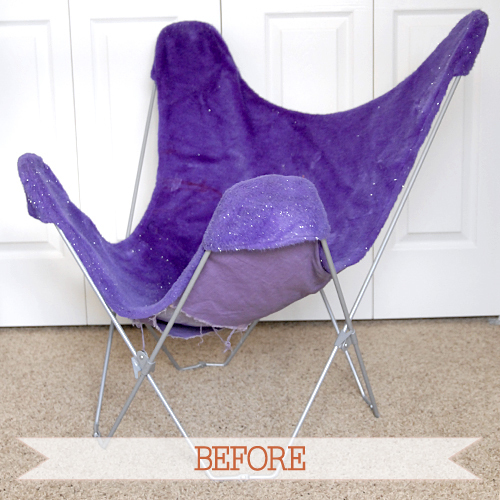 I can’t tell you how elated I am that I finally got around to recovering our nasty butterfly chair. My sister so kindly gifted this lovely chair to me when my parents moved & they were just going to donate it to D.I. or throw it out. Come on. I remember seeing a leather butterfly chair at Urban Outfitters for somewhere around $250, so naturally thought I’d better hold on to this chair – purple fuzz & all – because I may actually recover it in leather someday. I was incredibly tempted to do a hair-on calf skin, or some sort of antiqued leather, but I kept wussing out because I dreaded sewing the thing. 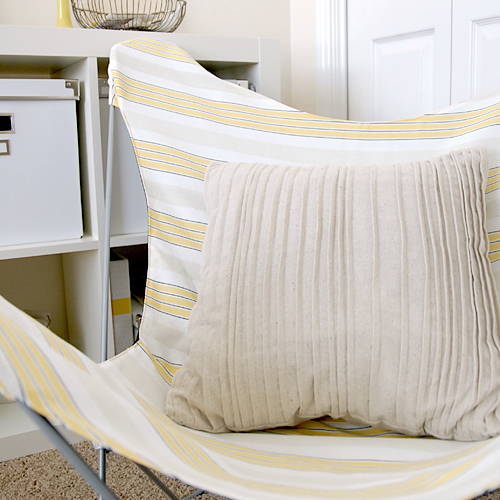 Nearly a year later, I bought some rad striped fabric from Ikea & just did it! It didn’t take me nearly as long to sew it as I had anticipated, but deconstructing the purple fuzzy cover for the pattern took 3 times as long as I thought it would. From start to finish, it took about 2 days worth of Penelope’s naps (about 6-8 hours). Now, if I have to do it again, I’d venture it’d take me under two, since I now have the pattern already made. I’m really happy with how it turned out, and I’m so excited to show you the results! I feel like it’s much better constructed with much higher quality materials than the last cover, but for some reason, I just don’t feel like Chris should sit in it (yet). Maybe it’s because I don’t trust my own craftsmanship. For now the legs are going to remain silver. I think it’d really pop with white legs (or perhaps bright yellow?! ), but I’m not about to open up the garage & spray paint something in 20º weather. NO thanks. That’ll be a job for next spring or summer. black backing: leftover from a previous project, like $2-3? NICE. That makes me happy. The best part about this chair is that it’s perfect for my studio. It folds up tightly so I can have it out of the way, but if Penelope’s hanging around while I’m crafting, or I need to take a little break, BOOM! I can just pull it out. I love the portability! So, what do you think? Do you like it? You can purchase the butterfly chair pattern here. It looks great! I like the silver legs, considering the weather, but it would be fun with yellow or white legs too. Looks awesome Melissa. Well done!! hA! At first I thought the purple one was your FINISHED one! I was like, “Oh no! Really? ?” hAA! I love it. You are the bomb. Good work, girl. Love it! It fits in perfectly with the rooms color palette. I love it! 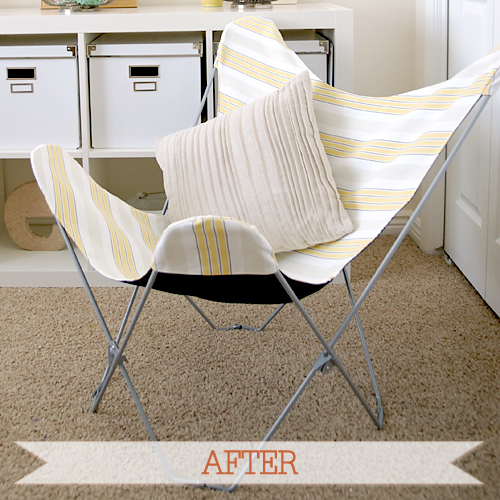 I have a butterfly chair waiting for a new cover… it’s been waiting for a looooong while. Any tips on deconstructing the pattern? Great makeover! Much better than fuzzy, sparkly, purple! I agree the legs would look better in another color. I think white would be more versatile if you wanted to make some different covers in the future though. It is LOVELY. I wish I had half of your sewing talent! then “oh ok i see” ! this looks terrific. i want one! I absolutely love it! The fabric choice couldn’t have been better. Great job! I think the purple one was better. Er, totally kidding. Love the new one! I think I’d be too intimidated to attempt such a project. Kudos! Thank you for the pattern, however you need a disclaimer: THIS DOES NOT FIT THE VINTAGE size frame. Made it this past weekend and although I can get it over the frame, it is just way too small. Hi, what a GREAT job you did. Any chance you still have the pattern? My great grandmother left us two chair frames and it would be brilliant to be able to make a cover for them. Check out istilllovecalligraphy.com/products. It should be listed there. You may want to make sure it’s the right size. I’ve been looking for a pattern to make a leather cover myself! Even though this pattern is designed to make a fabric version with.. it could still be used for leather right? I”m curious with how the different materials stretch. This should work just fine for leather. Just make sure you’re using a leather needle, slightly thicker thread (top-stitching thread will bog down your machine, though) and the longest stitch length you can to keep the leather strong. The final dimensions of this cover is 37″wide by 39″ tall when the material is laid flat. Hope that helps! Also can you share your dimensions? Trying to figure out if it will work with my frame. I would like to purchase your pattern, but before I do, could you let me know what the dimensions are for your frame? Like Victoria, I’d like to make sure it will fit. The chair pattern is no longer available for purchase.